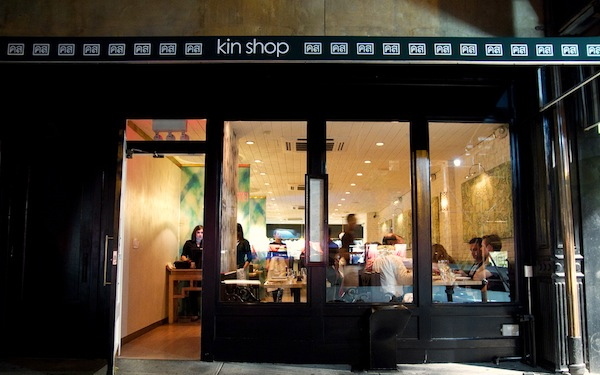 My only gripe with Harold Dieterle’s fantastically unfussy contempo-Thai restaurant, Kin Shop, is the lighting. Though the dim interiors go a long way towards making everyone seem that much more attractive, it’s heinous for the amateur iPhone photographer. 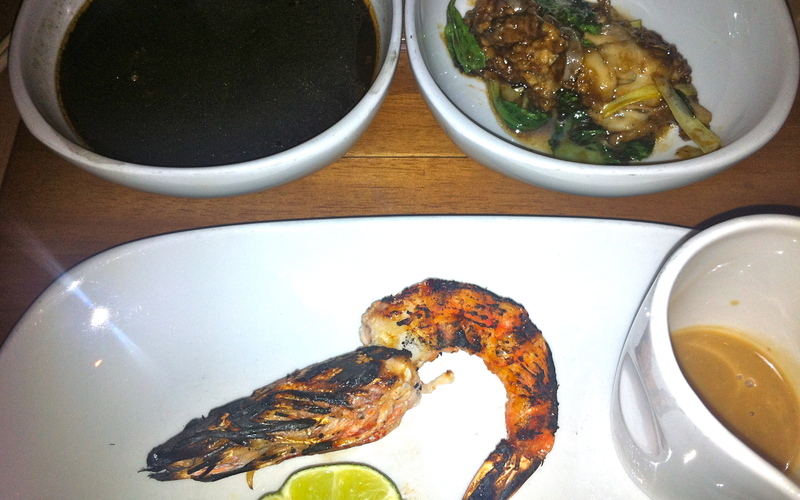 So, you’ll just have to trust me on this because my snapshots can’t begin to do the meal justice. Also, I’ve never been to Thailand (something I hope to remedy later this year) so neither can I vouch with any authority on esoteric matters of authenticity, yet I can safely say this is the best Thai food in New York – certainly following the all-too-brief lifespan of Lotus of Siam. Like a novice at a night market, I enter just a bit overwhelmed by the thick smells and smoky air. Immediately want a taste of everything. Instead me and my merry band do the next best thing, putting ourselves in the hands of the kitchen and opting for the five-course tasting. (At $65, it’s a smart bargain.) Things get off to a bang with miang, a traditional Thai street food of tasty bits ‘n’ pieces wrapped inside a leaf. 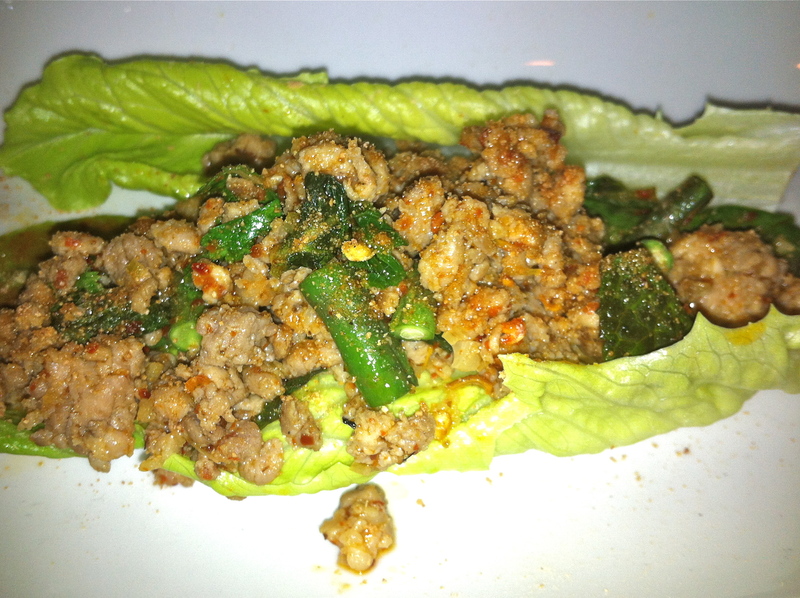 Here it’s a mix of fluke, lychee, chili jam, and crispy fried garlic on a shiso leaf. A myriad of contrasting flavors and textures, it’s the canape equivalent of an aperitif; a wake-up call, which tingles the palate in preparation for what’s to come: grilled prawns spiked with fresh lime and Phuket-style black peppercorn sauce; a succulent king-size crispy oyster over fried pork, peanuts and mint; squid ink and hot sesame oil soup (as delicious as it sounds disgusting). 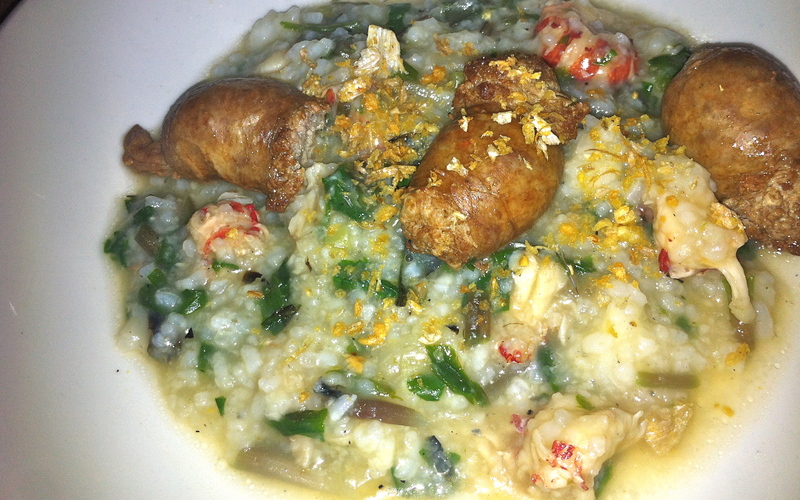 I’m made even happier when the special of the night arrives amusingly enough as the equivalent of a pasta course: grilled ramp congee with Chang Mai sausage, crayfish & crispy garlic. It’s the Greenmarket version of Thai comfort food, creamy, thick, and satisfying, with the addition of ramps, no less – the locavore’s answer to crack cocaine. 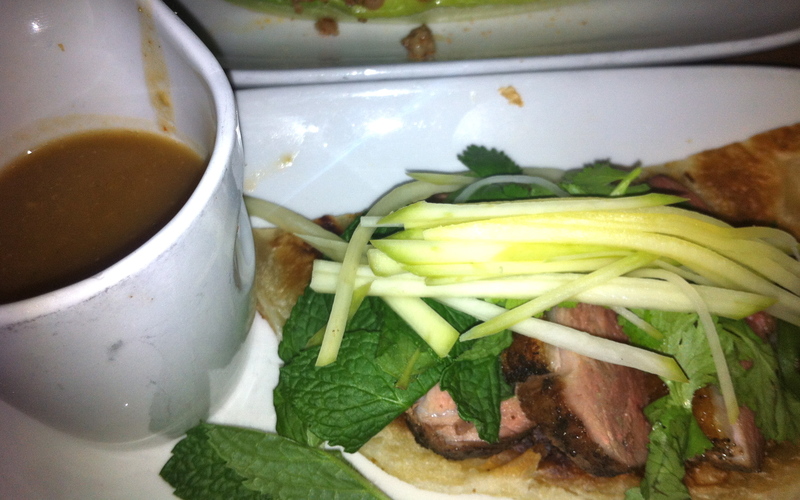 Two versions of duck arrive next: a perfectly pink and tender roasted breast under a fragrant mound of fresh herbs, topped with green mango and accompanied by tamarind water and a spicy duck laab salad riddled with birds-eye chilis that more than earns its four-alarm fire notation. (So potent are the effects of the chilis that more than one person in my party navigated a bout of gastrointestinal distress the following day. Me? I’ve never tasted such an exquisite mix of meat and heat in a single forkful. I could easily eat this dish over and over again.) And that’s a prime example of what’s so enjoyable about Dieterle’s menu. Even if it’s not necessarily always a traditionalist’s version of Thai food, there’s a mutual regard for both the cuisine and the diner that meets way above the middle. Except for desserts, there’s no dumbing down here for ignorant palates. In the piquant hands of this Top Chef everyone and everything rises.